Thought for the week: Goldilocks. 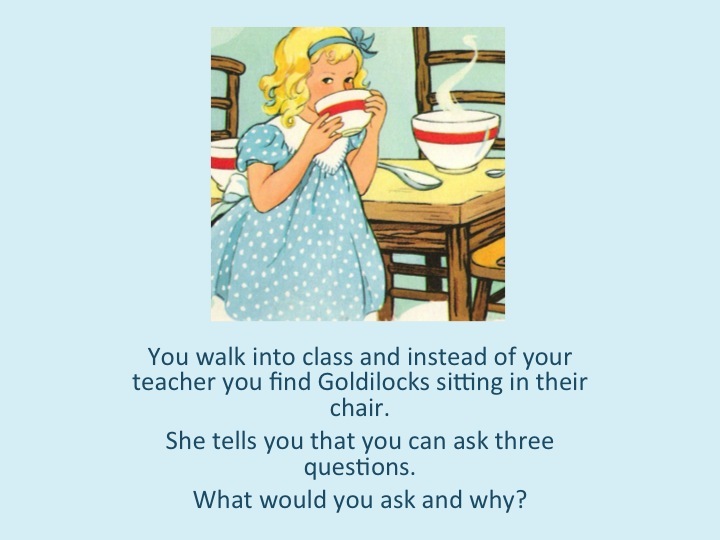 Do you mean you’d ask Goldilocks where your teacher has gone? Aren’t you meant to be in a fairytale? Aren’t you too young to teach? why she is in the real world instead of the fairy tale world? if shes going to be the new teacher? I agree jessica and i would ask goldilox What are you doing in my house !!!! Why did you eat my porridge? Why don’t ask them first? Are you hiding from the bears? I would ask her; why are you here instead of my teacher? Why are you so mean to take the three bears porridge? Shouldn’t you be in the fairytale Goldilocks and the three bears. Why are you here instead of my teacher ? Why are you so mean to take the three bears porridge ? Shouldn’t you be in a faiytale Goldilocks and the three bears? why did you have to come inside the house? why is your mother not looking for you? Sam.K – Why are you sitting in the teachers chair? Only teachers are allowed to sit on the teachers chair. Breanna – Why are you in our classroom? Are you a guest? Iqueeno – Why are you on your own? Jayda – Where is Mr Cambridge? Saim – Did you tell any of your family members about the incident with the three bears? Russell – Where do you live? Nyah – Why were you sneaking into the bears house? Sandro – Why are you always so rude? Why were you eating the food of the three bears? Remus – Can we play football everyday? Im asking because you may be our new teacher. Bruna – Why did you sleep in a strange bed? and do you need help getting home? Why are you here? I am asking because Mr Cambridge should be sitting there. Why did you eat the 3 bears food? I am asking because you shouldn’t eat someone’s food with out their permission. Why would you sneak into a strangers house? I am asking because they might kidnap you. What is your viewpoint of Goldilocks and the three bears? Why did you take all of the baby bears things? How did you feel when the bears started chasing you? I would ask her all of these questions because I want to hear her side of the story.